Here’s what seriously concerns me about this stuff and it is this. People just don’t think about it deeply enough. That’s simply what really seriously bothers me. People just shrug it off. I have said for years that political correctness is simply social and cultural Marxism, but we laugh it off and trivialise it by saying that “it’s political correctness gone mad” No it isn’t. It can’t go mad. It is mad. Insane even. Criminally insane and we laugh it off at our peril. In the meantime the cultural commissars go about their work. They have an agenda and the agenda is to force you to buckle under. 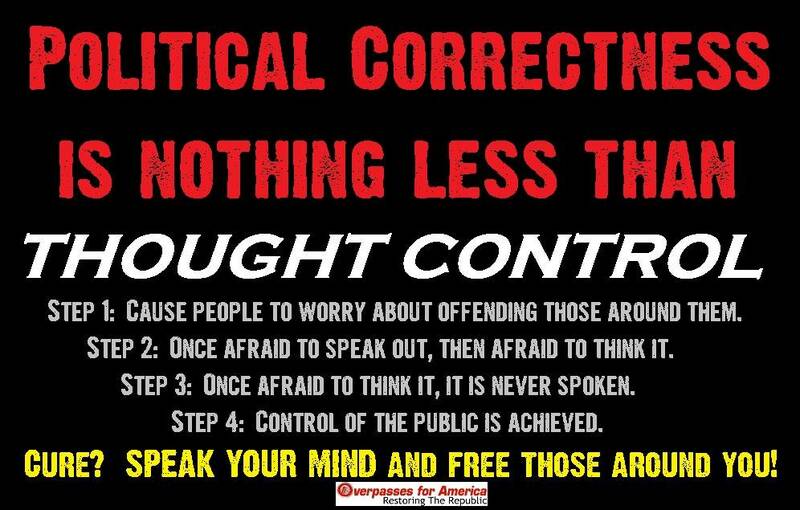 Political Correctness is about controlling what you think and therefore what you say but it’s been cleverly cloaked and masked in the language of decency, compassion, inclusiveness, not giving offence or being nasty and just doing and saying the right thing. And that’s what this “Words at work”, just like Safe Schools and all the other programs coming at us are designed to do. They are designed to force you to comply with and subscribe to hard left thought. It’s China in the times of Mao, Russia in the times of Lenin. It’s group think. If you have ever seen the movie The Time Machine from the early 60’s you’ll remember the Eloi and the Morlocks. We are fast becoming the Eloi. “..It’s official: no zone of life is safe from the long noses and wagging fingers of the lifestyle cops and word police. Not content with having strangled social life with irritating rules — making people stub out their fags in public places and put down their pint glasses at 3am — now the know-alls are barging into work life too. Into workplace banter, no less; into the chitchat that can make the 9 to 5 grind that bit more bearable. We’re doing it wrong, you see. Apparently our workplace repartee is toxic and dangerous, like everything else we do when we don’t have a PhD-wielding expert whispering advice in our lugholes. Words At Work, a campaign launched by Diversity Council Australia, is designed to correct the unwittingly racist, sexist, disabilist lingo of your average boneheaded worker. Spearheaded by David Morrison, Australian of the Year and former lieutenant general, it’s about getting people to “think about the words they use” and use only words that make everyone feel “respected, valued and included”. The promo video for Words At Work wonders if phrases such as “walk the talk” are acceptable considering some people can’t walk. This is a recipe for social paralysis, for being so insanely obsessed with the words we use that we never chill out and chat. No offence to insane people, by the way: insane now is used simply to mean silly, daft. And that’s the point. Language evolves. This is where the mad — PC correction: unwise — obsession with chatter gets us: to a situation where we just don’t know what it’s safe to say, and where we all turn stiff and uncertain and less willing to engage with each other. The urge to police banter is taking hold cross the West. On US campuses there are clampdowns on “microaggressions”, which one expert describes as “brief … verbal indignities”. Everything from asking someone with a foreign name “Where are you from?” to commenting on a black girl’s (sorry, woman’s) hair has been rebranded a racial microaggression on some campuses. Which means even people making polite conversation and paying compliments risk being branded bigots. The war on workplace chat speaks to the misanthropy of our age. It implies that even everyday conversation is a moral minefield. It undermines that sense of solidarity we gain when we engage with each other directly and freely. It cripples social engagement. Oh god. I shouldn’t say cripple. Sorry.